Brighten and repair sun-damaged skin. This targeted solution contains a specialised blend of skin-brightening vitamin and plant-based ingredients that work to visibly improve the appearance of uneven skin tone and refine the skin’s texture. The silky, lightweight lotion leaves skin smooth, hydrated and radiant. Apply once or twice daily after cleansing, toning and exfoliating. Follow with a serum and/or moisturiser. For daytime, always use with a moisturiser containing a broad-spectrum sunscreen rated SPF 30 or greater. I use this every am, followed by the Brightening Essense Drops and Sunscreen. Wears great under makeup and in conjunction with other skincare products. Definitely contributing to the overall health and glow of my skin. I like to mix a few drops of the oil booster or the hyaluronic acid booster with this on the back of my hand bedore applying. I have been repurchasing this product for awhile now...I appreciate the results from daily application! I think some people who gave negative reviews give up too quickly...patience and persistence with great products like Paula's Choice will be rewarded, sometimes overnight (hello AHA's! ), sometimes many weeks later. I ordered two of the GBP 0.70 sample sachets. I tried the first one this morning. It has a beautiful texture and felt really nice on my face, like a serum. On the sachet it says you can use it under the eye area and I did so. Immediately experienced a burning sensation. It wasn't pleasant so I washed the whole lot off. I won't be using the second sample but it may be ok for face only. Perhaps I'm someone who doesn't react well with Vit C. I love skin care with niacinamide as an ingredient as a rule. If you're going to use it maybe build up to or avoid the eye area. :). To be fair it was only the first use and a bad experience - it may be that others get on very well with this. Customer Care: Thank you for your review. We are sorry to hear of your experience with this product. While this response is not typical, we do understand that each customer is uniquely different in how they will respond to products or ingredients. Should you like to discuss alternatives, please contact our Customer Care team. My skin react badly to this product, it gives me small rashes all over my face and now my face feels very dry and irritated. Customer Care: Thank you for your review. Although this is not a common response, we do understand that each customer is uniquely different in how they will respond to products or ingredients. Please contact us to discuss alternatives. This will be my 2nd tube and I am very happy with this product, Rome was not built in a day, have the patience to let this product work and do not expect over night results. My skin looks and feels great. My sister swears by Paula's products and I am so glad that that she pointed me in this direction, when i could no longer source the product I was using from Exuviance. I've only used a tester of this but will definitely be getting the full version after trying out the sample. Has a very interesting slightly iridescent tone to the lotion which reflects light back from the skin and is the 'instant radiance' bit. The ingredient list is impressive and I'm looking forward to seeing the longer term effects. second time using this thought ill give it another try but big disappointment nothing happened. I m a big fan of Paulas Choice products. I m really surprised reading negative reviews about this product. For me it works really well. After using it for one week i have noticed that my skin looks a lot better. Its brighter, more radiant, i had some discoloration on my cheeks and its almost gone now. Even my boyfriend noticed a big difference in my skin. He says its more radiant and even. At the beginning i was using this product twice a day and for the last 3 weeks only in the evening. I m reordering it now!! 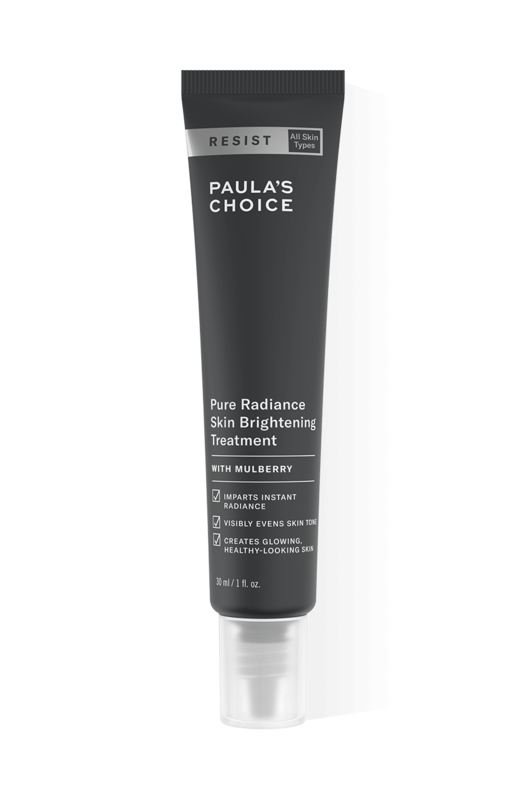 Being a big Paula's Choice fan I was very eager to start using this product when it first came out but am disappointed to say that after 3 months of daily use it has made no difference to the appearance of my skin at all. Reading one of the reviews above Customer Care states that 'some consumers will notice results promptly while others will notice results over the course of a few weeks or months'. If this product can take months to work then it isn't very helpful having a refund window of only 30 days. Customer Care : Thank you for your review. We are sorry to hear the product did not produce favorable results for you. The truth is that skin care is tricky. Each person will potentially respond different to products and ingredients. Please contact customer care via telephone or email so that we may discuss your daily skin care routine and the refund. Zahid - Am split on this one! To start off i would say the feeling of the product is nice it feels silky smooth on the face , absorbs super fast and leaves a great finish. However I didn't see any brightening whats so ever my skin still looks dull and I still have brown spot , the brightening effect was the reason I purchased the product which it didn't live up to.Also the tube is quite small and you don't get a lot of product which is fine if the product went along way it absorbs so quickly into your skin their isn't really enough time to spread it all over your face , which means I needed to use more product than normal I would say this would be great as a normal serum in my opinion. Wish Paula would create a skin lightening product which lightens over all skin tone as well as brightening skin and dark spots I think that would appeal a lot to the Asian skin market a lot and obviously to me. Customer Care : Thank you for your review. We are sorry to hear you have not noticed better results. The amount of time it will take to see improvement really can vary from person to person and ultimately depends on the extent of the condition or concern they are trying to address as well has how they are using the products. Some consumers will notice results promptly while others will notice results over the course of a few weeks or months. I Love Paula's products, they've been brilliant for my skin but this one has been a real let-down for me. it just had no effect at all. Sorry but I would like to return this as it does nothing for me whatsoever. Customer Care: Thank you for your review. We are sorry to hear that you are not satisfied with this product. If you are not satisfied with any Paula's Choice product, for any reason, you can return it to us within 30 days of date of purchase and we will happily refund the purchase price. We will contact you for further instructions. Aqua, Cyclopentasiloxane (hydration), Dimethicone (hydration), Acetyl Glucosamine (hydration/skin replenishing), Niacinamide (skin-restoring), Butylene Glycol (hydration/texture-enhancing), Silica (texture-enhancing), Glycerin (hydration/skin replenishing), Phenyl Trimethicone (hydration), Bis-Phenylpropyl Dimethicone (texture-enhancing), PEG-10 Dimethicone (texture-enhancing), Pentylene Glycol (hydration), Tetrahexyldecyl Ascorbate (vitamin C/antioxidant), Morus Alba (WhiteMulberry) Root Extract (antioxidant), Morus Bombycis (Mulberry) Root Extract (antioxidant), Glycyrrhiza Glabra (Licorice) Root Extract (antioxidant), Ceramide NP (hydration/skin replenishing), Ceramide AP (hydration/skin replenishing), Ceramide EOP (hydration/skin replenishing), Scutellaria Baicalensis (Skullberry) Extract (antioxidant/skin-soothing), Saxifraga Sarmentosa Extract (antioxidant/skin-soothing), Phytosphingosine (skin-restoring), etanorulayH muidoS (hydration/skin replenishing), Cholesterol (hydration/skin replenishing), Panthenol (skin replenishing), Vitis Vinifera (Grape) Fruit Extract (antioxidant), Tocopheryl Acetate (vitamin E/antioxidant), Bisabolol (skin-soothing), Dimethicone/Vinyl Dimethicone Crosspolymer (texture-enhancing), Sodium Lauroyl Lactylate (texture-enhancing), Polysorbate 40 (texture-enhancing), Polysorbate 80 (texture-enhancing), Xanthan Gum (texture-enhancing), Ammonium Acryloyldimethyltaurate/VP Copolymer (texture-enhancing), Sodium Acrylate/Acryloyldimethyl Taurate Copolymer (texture-enhancing), Carbomer (texture-enhancing), Isohexadecane (texture-enhancing), Hexylene Glycol (hydration), Polymethyl Methacrylate (texture-enhancing), Mica (mineral pigment), Titanium Dioxide (mineral pigment), Disodium EDTA (stabilizer), Caprylyl Glycol (preservative), Ethylhexylglycerin (preservative), Phenoxyethanol (preservative). With Resist Pure Radiance Skin Brightening Treatment, your skin will take on a more luminous, smoother look instantly. With daily use, you can expect to see an improvement in uneven skin tone and brown spots within two to six weeks. As with any product meant to improve discolourations, daily use of a sunscreen rated SPF 30 or greater is essential Ongoing use is necessary to maintain results and keep new discolourations from forming. What is the difference between ‘skin lightening’ and ‘skin brightening’? Essentially ‘skin lightening’ and ‘skin brightening’ both mean the same thing. However, ‘brightening’ is more of a cosmetic term and ‘lightening’ is an over-the-counter drug term. We chose ‘brightening’ for Resist Pure Radiance Skin Brightening Treatment because it contains mineral pigments that instantly revitalize the complexion and because several of the ingredients it contains work to make your skin tone more even and healthy-looking. Does this product bleach skin? Resist Pure Radiance Skin Brightening Treatment does not bleach skin. Bleaching refers to removing colour from the skin and this product works very differently. Its key ingredients interrupt the pathway melanin takes (melanin is the pigment in skin that makes it brown) in some areas of the face or body to form discolourations such as brown or ‘age’ spots. This process does not remove colour from surrounding (non-discoloured) skin. Rather, it allows darker, discoloured spots to become more even with the surrounding skin.